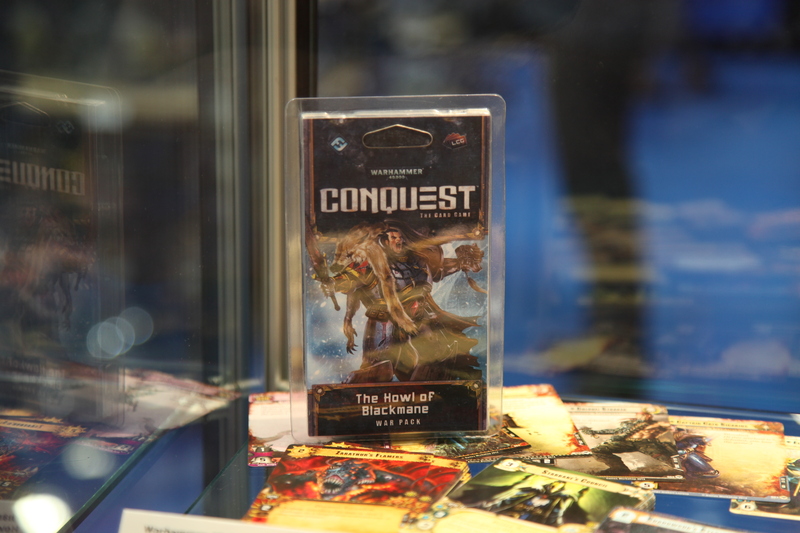 Hands-On: Warhammer 40,000 Conquest: Cards For The Emperor! 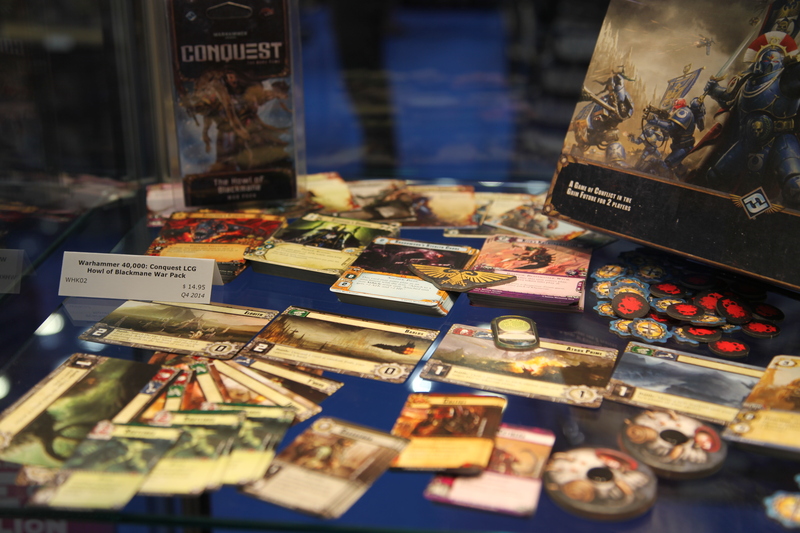 Fantasy Flight's upcoming living card game Warhammer 40,000 Conquest is prime for release. 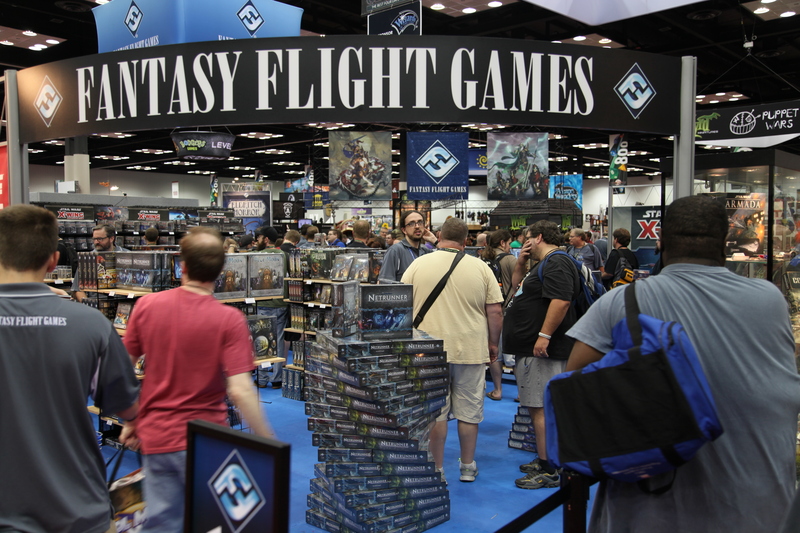 Earlier this year, Fantasy Flight Games announced that it would be extending its Living Card Game line with Warhammer 40,000 Conquest, putting it into a pedigree of brands including Netrunner, Game of Thrones, Star Wars, and more. The game is scheduled to come out sometime soon later this year, but early copies were available for sale at Gen Con and demos and tournaments for those wanting to get their first chance to play. For those unfamiliar, a Living Card Game essentially bridges the gap between a normal trading card game and a board game. Rather than relying on random boosters to supplement your collection, a LCG simply releases expansions with all the cards you need. No more hunting around for rare cards, you simply have a playset of all of them - as long as you're keeping up with the new releases. Basically the goal is that you can always have the full game available to you, giving you more readily available freedom for deck construction and strategy. 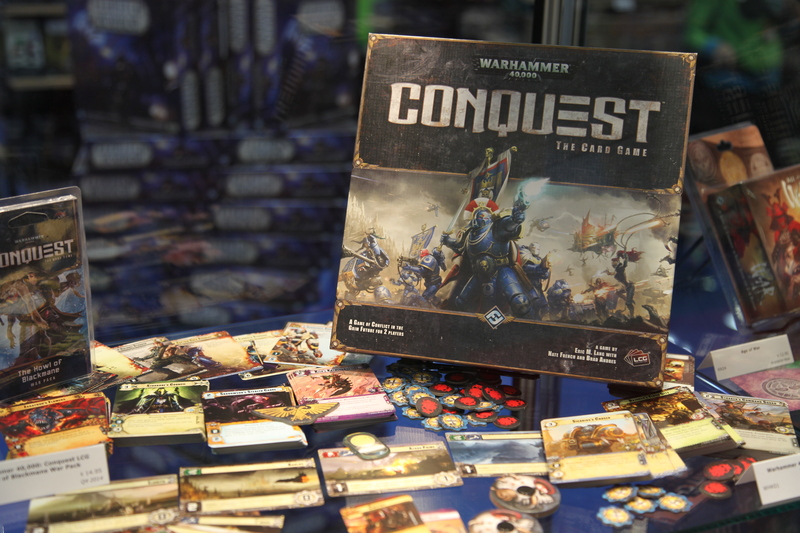 Like a lot of other great cards games, at the surface Warhammer 40,000 Conquest is a pretty simple game. 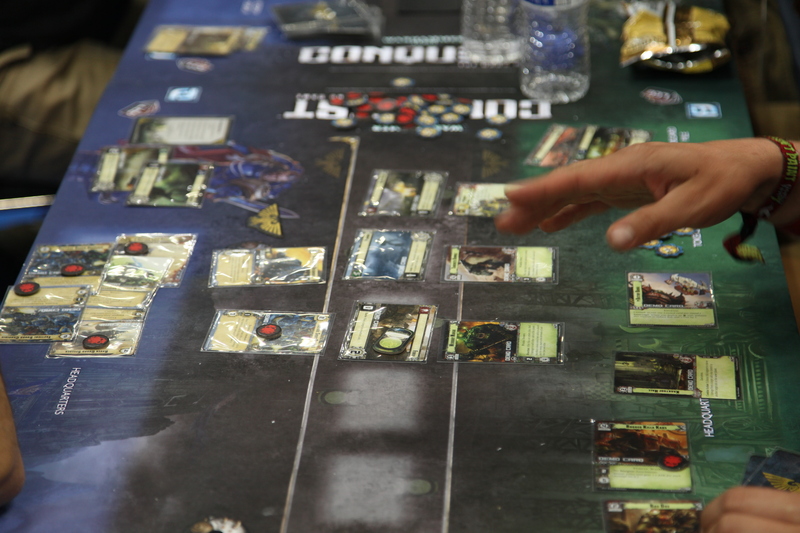 Players spend resources to deploy troops to planets and fight it out to control them, and the first player to control three planets with matching types or to kill the opponents warlord wins the game. You will however find that the game becomes a lot more nuanced than that. 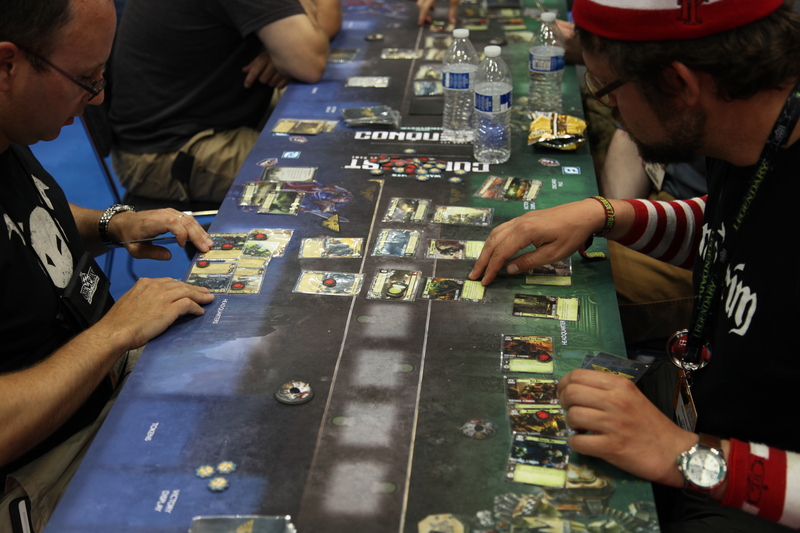 Each player starts the game by building a 50 card deck along with selecting a warlord. Each warlord comes with eight signature cards that must be included in the deck. These cards tend to be a little better value to cost ratio than average, so it doesn't quite feel like it's putting a wrench into your deck construction plans. Players can choose there warlord from one of the seven starting factions, Space Marines, Tau, Eldar, Dark Eldar, Chaos, Orks, and Astra Miltarum (Imperial Guard). New factions and warlords have already been announced as coming soon. Once your deck is ready, you begin play by collecting your starting hand and resources. Seven planets are placed onto the field, with two of them being left face down and one of them is marked as the first planet. The first planet is important because it's the only planet that can be captured that turn. Players then take turns deploying army and support units to their planets and HQ, and this is where a lot of the strategy comes into play. You only need to win three matched planets, so it's not necessary, or a good plan to win, to keep sending units into the meat grinder of the first planet. 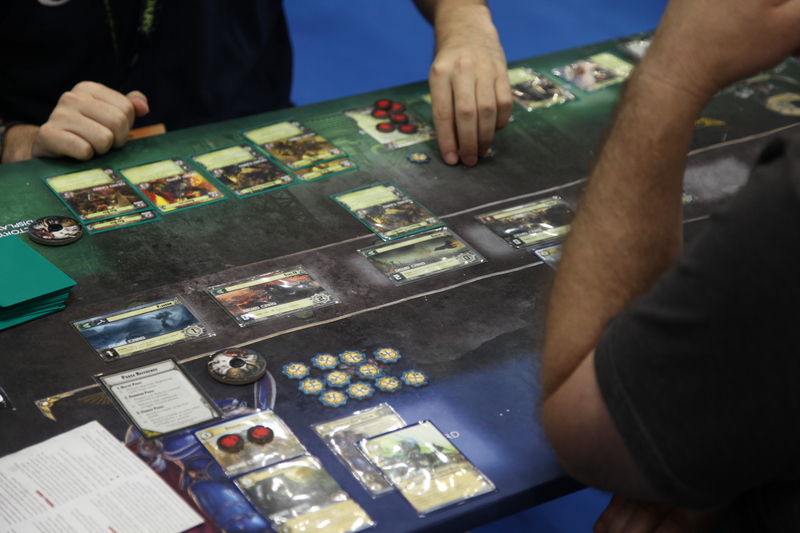 You'll also want to commit some units to other planets in order to claim their resources for the turn. One of the interesting gameplay mechanics for the game is that your warlord is always committed in secret, using a little dial that both players flip over simultaneously. Not only do warlords supersede command when they are at a planet and not opposed by a rival warlord, but they also cause a battle to happen - letting you use the battle ability printed on that planet should you win the fight. Likewise in battles, players will take turns exhausting units to deal damage to opposing units. While there are a certain number of just generic vanilla stat block units, a lot of them otherwise come with abilities that seem well suited to capture the feel of the Warhammer 40,000 universe. Orks frequently come with the Brutal keyword, that makes them do more damage when they are wounded, where as a Space Marine Termanitor squad might ignore a portion of damage while it's not exhausted, tapped. Winning comes down to properly setting up your points of contention, trying to hinge the game on a single planet that you've already reinforced with units and timed to have the initiative on. But what makes the game interesting is you're never quite down and out, even if your opponent is really far ahead. Often in the late game there's going to be a separate game of cat and mouse where players try to guess where the enemy warlord, whose usually accumulated a fair bit of damage by then, is headed. As for the physical game itself, Warhammer 40,000 Conquest is exactly what we've come to expect from Fantasy Flight Games. Everything is high quality and looks great. Oh yeah, and Orks can be pretty busted. Waaagh!